Once again, please note that as we currently track the results of two auction houses, the following is based on a subset of the whole secondary whisky market only. The size of these two auction houses and the fact that they serve two different markets (UK and Central Europe) make us believe that the share of the market that we cover should be sufficiently high to generalize the results to some degree. 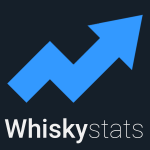 Also be aware that Whiskystats (for the time being) solely focuses on scotch and japanese single malt whiskies! If you compare these results to last year’s annual report you may notice that some of the figures changed. The reason for this is that during 2017 we added some historic price observations from Bonhams Hong Kong which were not included back then. We start-off by having a look at the sheer number of bottles that were traded on the auction houses we track. In our whisky database we find 60.210 price observations for the year of 2017. These are 8.000 trades more than there were in 2016 which equals an 15% increase in the number of bottles traded. Next we simply sum-up the paid prices for these bottles to find out what the total observed trading volume was. 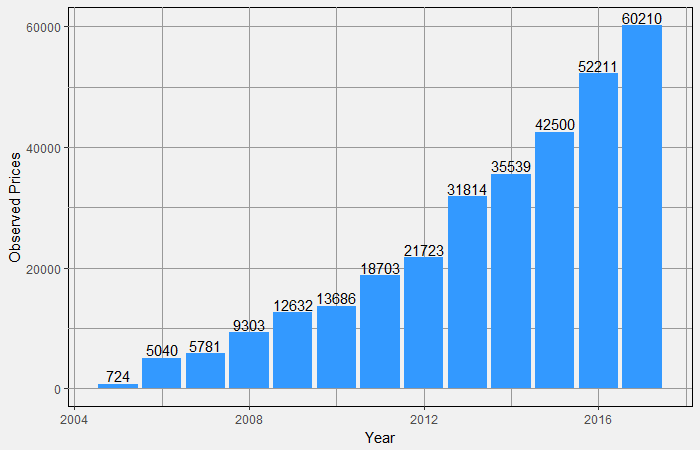 For the first time in Whiskystats history this figure exceeded 20 Mio. Euros. The total worth of all bottles traded in 2017 was 20,9 Mio. Euros. This equals a 12% increase compared to 2016. According to Adam Ries this means that the average price per bottle was around 350 Euros. Similar to 2016 we observe an higher increase in the number of bottles traded than in the total trading volume. 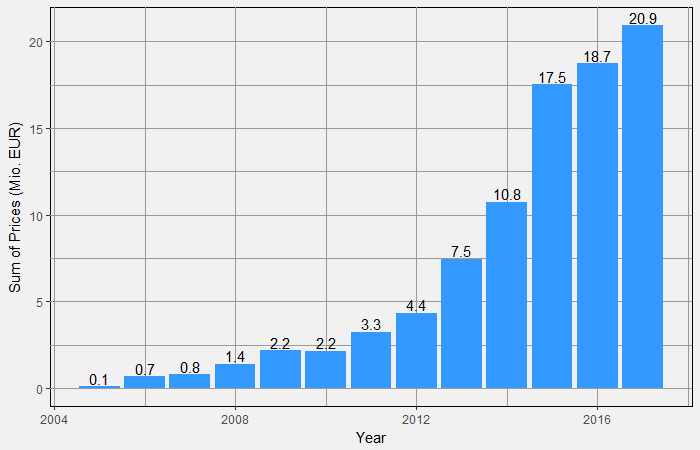 While the number of trades climbed by 15%, the trading volume did so by only 12%. This difference is not that big as it was last year, still it seems like more and more “cheaper” bottlings are traded on auctions. And by the way, compared to only three years ago in 2014 the total trading volume almost doubled! 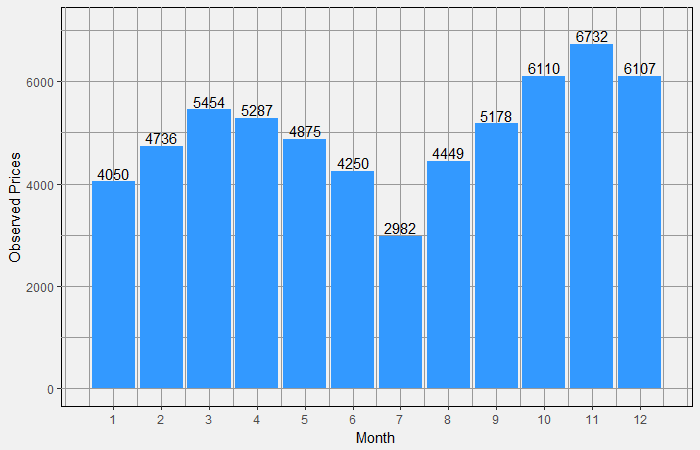 Last year we also took a closer look on the trades by month and this we want to repeat here. Very much like in 2016 it seems like the months of October, November and December are those for which we observed the most trades. Also like last year, the auction market slowed down during the summer months where July is a special case because one of the auction houses was on summer brake there. As we have already mentioned the average price per bottle traded in 2017 was 350 Euros. 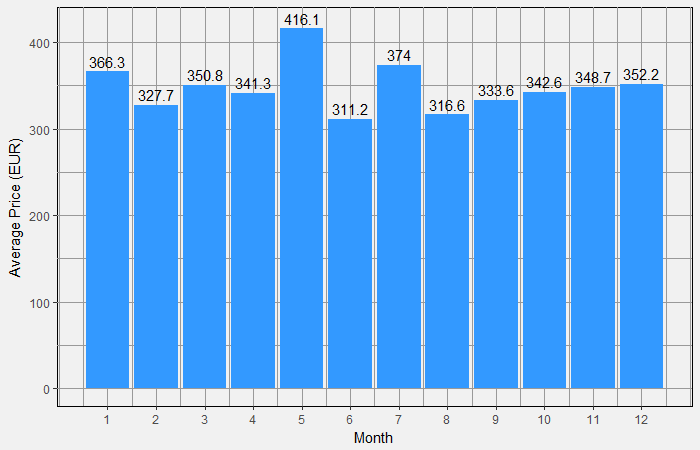 Below we also calculated the average prices per month. In 2016 the month with the highest average price observed was November with 371 Euros. This time, in 2017, the 4.875 trades in May averaged to 416 Euros. Overall it seems like the whisky auction market is most active during the end of the year and in the months of spring. Together with the observations of last year this seems like a pretty obvious pattern and is probably no surprise to many. In the second part of our annual report, which will follow in the next weeks, we focus on the major market movements. Also we will recheck on our “Age Matters” topic of our 2016 annual report. We finally start combining measures of taste with our analysis of historic auction prices. This new category is called “Taste ‘n’ Stats” and the Devil´s Punch Bowl trilogy by Arran is the first object under investigation.